Nov 25, 2014 ... Kuby Immunology ... Definition: The strict definition of immunological tolerance occurs ... immunological memory, it can exist in T cells, B cells. Jan 15, 2013 - Richard Flavell and Tian Chi*. Department of Immunobiology, Yale University Medical School, ..... (A, B) Gross anatomy (A) and histology. CA). 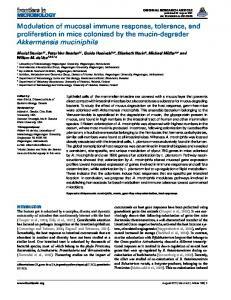 The magnitude of the patient shift is assessed by compar- ing the shift to a .... Â±6.84 Âµmol/L. Â±35% or 20%. CA 125. Â±40%. CA 15-3. Â±20%. CA 549. Â±20%. Oct 23, 2016 - Allied Science etc. With its territorial jurisdiction extending over the eight districts of western U.P., the. University is a premier institution of higher. rupted by the addition of 2 ml. of dinitrosalicylic acid reagent. The tube ..... 1 G. L. Baker, G. H. Joseph, Z. I. Kertesz, H. H. Mottern, and A. G. Olsen, Chem. Abbott Cell-Dyn 3500 (closed sampler CS and sample loader SL), CD 3700. tWBC + 5 part differential analysis (reticulocytes optional). Application. Description. Oct 15, 1997 ... K-Diff Control L/N/H. 3896/3897/3898. 2.5 ml. Sysmex K series 1000. tWBC + 3 part differential analysis. Application. Description. Product Nr. Reagent for silver, copper and mercury ... Sodium diethyldithiocarbamate and. Diethylammoniumi diethyldithiocarbamate. Reagents for copper and zinc. BC-5300, BC-5380, BC-5100, BC-5180. M-50 Diluent, LEO(I) Lyse, LEO(II) Lyse, LBA Lyse, LH Lyse, Cleanser, Probe Cleanser. BC-5500, BC-5200. Dec 17, 2015 - This, and the spectre of violence in the campaign period, marred the .... These were then shared widely by social media, thus allowing. University of Florida College of Medicine, Gainesville, Florida, USA; 3Department of Medicine, ... genetically engineering cancer patients' DCs may improve. Aug 1, 2011 - NM 009789. F: ATGTGTGCTGAGAAGTCTCCT. R: CGCCATTCTTATCCAGCTCCTT. Glycosylation dependent adhesion molecule 1. Glycam1. icity in vivo animal models. Some are in early (AC1215) and others, like panobinostat, are in late clinical devel- opment as treatments for multiple myeloma. Jun 4, 2010 - Svetislav Zaric,1,4* Charles Shelburne,2 Richard Darveau,3 Derek J. Quinn,1 .... control of neutrophil life span and induction of apoptosis (24). Annu. Rev. Med. 2007.58:329-346. Downloaded from arjournals.annualreviews.org by University of California - San Francisco on 01/12/07. For personal use only. Recent advances in immunology and a growing arsenal of new drugs are bringing the focus of tolerance research from animal models into the clinical setting. The conceptual framework for therapeutic tolerance induction has shifted from a “sledgehammer” approach that relies solely on cellular depletion and cytokine targeting, to a strategy directed toward restoring a functional balance across the immune system, namely the different populations of naive cells, effector and memory cells, and regulatory cells. 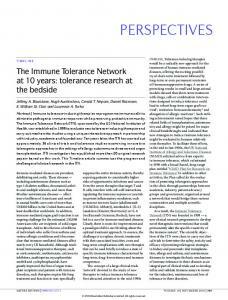 Unlocking the key to tolerance induction in the future will likely depend on our ability to harness the functions of T regulatory cells. Also, dendritic cells are strategically positioned at the interface between innate and adaptive immunity and may be subject to deliberate medical intervention in a way that can control a chronic inﬂammatory response. Many reagents with tolerance-inducing potential are currently undergoing clinical testing in transplantation, autoimmune diseases, and allergic diseases, and even more that are on the horizon promise to offer enormous beneﬁts to human health. The ability of the immune system to distinguish self from nonself and harmful from harmless molecules can be operationally deﬁned as immune tolerance. A breakdown in tolerance is a common thread underlying many human diseases. Indeed, much of our understanding of the regulation of the immune system has come from the investigation of conditions featuring impaired tolerance to self (e.g., autoimmune diseases) or otherwise harmless molecules (e.g., allergic diseases), as well as the induction of tolerance following transplantation of an allogeneic organ or tissue. In fact, the ability to suppress aberrant or simply unwanted immune responses in a speciﬁc and permanent manner, without compromising host defense—in other words, to create a state of immune tolerance—has been the “holy grail” of immunology ever since tolerance induction was ﬁrst demonstrated in mice more than 50 years ago (1). This review describes the molecular pathways that maintain a tolerant state and discusses the rapidly expanding armamentarium of potential tolerance-inducing reagents that are now making their way into clinical investigation. Rather than exhaustively describe the dozens of novel protolerogenic drugs in development, this short review focuses on key agents in the later stages of clinical development across the diverse ﬁelds of transplantation, autoimmunity, allergy, and asthma. negative signals delivered through the antigen receptors and other cell surface signaling molecules (2, 3). Although the majority of self-reactive T and B cells are deleted through apoptotic mechanisms or receptor editing (in the case of B cells) (4), self-reactive clones may escape deletion and vigorously respond if challenged by infection, self-antigen in the context of innate or adaptive help, or a selfmimicking foreign antigen (5). In the peripheral immune system, the key mechanisms that establish and maintain tolerance include clonal deletion, anergy, ignorance, and regulation (Figure 1). For instance, T cell stimulation by foreign antigen can promote active cell death to prevent excessive expansion of T cells. Aging MRL-lpr mice with a deﬁciency in apoptosis caused by the insertion of a retroviral transposon in the Fas gene develop a profound lymphadenopathy and a lupus-like disease (6). Similarly, humans with Fas mutations develop an autoimmune lymphoproliferative disease characterized by defective T cell apoptosis, massive lymphadenopathy, splenomegaly, autoantibody production, autoimmune hemolytic anemia, thrombocytopenia, and neutropenia (7). Thus, dysregulated T cell homeostasis is an important checkpoint in some cases of autoimmunity. In addition to receiving a signal through the T cell receptor (TCR), the T cell requires a second activation signal to enable a productive immune response. The most important costimulatory pathway for T cell activation involves CD28 expressed on T cells and its ligands B7.1 (CD80) and B7.2 (CD86) on antigen-presenting cells (APCs). Engagement of CD28 by B7 molecules lowers the threshold for TCR signaling required for T cell activation, ampliﬁes cytokine responses, and promotes T cell proliferation, survival, and differentiation (8). In several animal models of autoimmune disease and organ transplantation, blocking this interaction following TCR and coreceptor (CD4 or CD8) engagement results in extensive cell death, anergy induction and robust tolerance (9). X-linked immunodeﬁciency syndrome IPEX (immune dysregulation, polyendocrinopathy, enteropathy, X-linked syndrome), which causes autoimmune disease in multiple organs (e.g., type 1 diabetes, hemolytic anemia, and thyroiditis), inﬂammatory bowel disease, atopic dermatitis, and fatal infection (20). A recent study has shown that FoxP3 mutations in patients with IPEX are characterized by heterogeneous clinical phenotypes and regulatory abnormalities, including not only a lack of CD4+ CD25+ Tregs but also a dysfunction of these cells. In some of these patients, the effector CD4+ CD25− T cells show reduced susceptibility to suppression (21). New avenues are being considered for therapeutic intervention focused on harnessing the regulatory functions of these cells. and provoke an immune response. 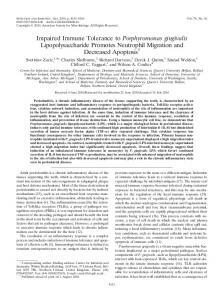 TLR antagonists may also be useful in downregulating certain types of inﬂammatory responses, leading to a tolerant state. However, it is important to emphasize that most of our understanding of tolerance is derived from animal rather than human studies. Perhaps the most signiﬁcant barrier to the development of tolerance therapeutics in humans is the absence of well-deﬁned biomarkers of tolerance. Without validated biomarkers, studies are limited to the use of clinical endpoints that deﬁne tolerance in an operational rather than an immunological sense. Other challenges include difﬁculties in sampling sites of tissue pathology in vivo (sampling is often limited to the blood), interpreting “tolerance signatures” from the laboratory in the context of concomitant immunosuppressive drug therapy, and the inability to distinguish disease-related, antigenspeciﬁc responses in affected versus healthy individuals. Despite these challenges, however, a number of promising protolerogenic strategies are indeed moving into the clinic for testing in transplantation as well as in autoimmune and allergic diseases. pression and, in some cases, to induce transplant tolerance. Mixed chimerism. In 1999, tolerance to a renal transplant was induced by creating mixed allogeneic chimerism in a patient with multiple myeloma and renal failure (27, 28). The patient was cured of multiple myeloma and later withdrawn from maintenance immunosuppression without subsequent rejection of the graft. In a study supported by the Immune Tolerance Network (ITN), Sykes and colleagues studied six patients with renal failure as a result of multiple myeloma to determine if a nonmyeloablative conditioning regimen followed by simultaneous bone marrow and kidney transplantation from HLAidentical sibling donors would successfully treat the myeloma and promote long-term allograft acceptance. Despite losing detectable chimerism, three of the patients accepted their kidney allografts and remained free of immunosuppressive therapy for 1.3 to >7 years (29). While in vitro studies detected antidonor alloresponses, cytotoxic T cells from these ostensibly tolerant patients were unresponsive to cultured renal tubular epithelial cells from the donor. At least two of these patients had complete operational tolerance to the kidney allograft; however, some developed chronic GVHD and suffered complications from the myeloma. More work is needed to reduce the incidence and severity of GVHD in this setting and improve our understanding of tolerance mechanisms. 1H, a monoclonal antibody directed at the cell surface molecule CD52, which is expressed on multiple cell types, have generated mixed results (41). The profound but selective depletion of certain cells with this drug is significantly immunosuppressive but may impede tolerance induction. plants has shown some success in inducing long-term remission in severe, refractory systemic lupus erythematosus (SLE), with mixed results in other indications such as multiple sclerosis, Crohn’s disease, and systemic sclerosis (43). There is general concern, however, that a genetic predisposition to autoimmunity may result in disease recurrence, despite full reconstitution of the immune system. In addition, allogeneic bone marrow transplantation has been tested in some cases; however, this approach leaves patients at risk for GVHD and other associated comorbidities. release reaction that typically occurs after the ﬁrst dose of the unmodiﬁed version of these antibodies. A randomized phase I/II open-label trial of hOKT3γ1(Ala-Ala) for the treatment of patients with new-onset type 1 diabetes showed a signiﬁcant reduction in the loss of insulin production, as measured by stimulated C-peptide responses, compared with an untreated control group (55). Improvement in the C-peptide responses was evident even two years after treatment, although these responses declined during the second year (56). The other antibody, antiChAglyCD3, showed similar efﬁcacy in a randomized placebo-controlled trial involving 80 patients with type 1 diabetes (57). Consistent with observations in mice, patients treated with anti-CD3 monoclonal antibody [hOKT3γ1(Ala-Ala)] develop IL-10producing CD4+ T cells, as well as CD8+ regulatory T cells (58, 59). Clinical efﬁcacy of anti-CD3 monoclonal antibodies has also been observed in other chronic inﬂammatory states, including psoriatic arthritis and ulcerative colitis (60; S. Plevy, personal communication). anti-CD3 antibody treatment profoundly decreased progression of type 1 diabetes (72). be a suitable alternative because of alum’s immunomodulatory effects when given with an antigen. These alum formulations may modulate DCs, resulting in a Th1-biased response. Indeed, the addition of alum to allergenstimulated human peripheral blood mononuclear cell cultures has been shown to profoundly suppress Th2 cytokine production (94). SUMMARY The explosion of new knowledge in immunology has illuminated new fundamental mechanisms regulating the immune system, to the point that tolerance induction by deliberate medical intervention is now foreseeable. A major shift has occurred in the paradigm of therapeutic tolerance induction. No longer is it believed that wholesale T or B cell depletion or cytokine targeting alone will bring about a tolerant state. Rather, tolerance induction will require restoration of a ﬁne balance in the function of naive, memory and regulatory cells. The discovery and characterization of the role of CD4+ CD25+ FoxP3+ Tregs has perhaps done the most to motivate the development of clinical strategies based on this new concept. Equally important are DCs, which are strategically equipped at the interface between innate and adaptive immunity to produce broad-ranging immunoregulatory effects. Exciting opportunities lie ahead for clinical trials of novel tolerance-inducing therapies with the burgeoning arsenal of immunomodulatory drugs. The insights gained from these trials are being enhanced by new technologies that directly identify antigen-reactive cells, as well as by genomic and multiplex proteomic assays that can begin to elucidate phenotypic and functional “signatures” of immune tolerance. Therapeutic tolerance is indeed reaching the clinic, where it promises to dramatically improve the outcomes of patients with organ transplants, autoimmune diseases and allergic disorders. SUMMARY POINTS 1. The discovery of CD4+ CD25+ FoxP3+ T regulatory cells has shifted the paradigm in tolerance research toward the clinical testing of therapies that induce active regulation. 2. Costimulatory blockade has ﬁnally translated into an approved drug, but as a therapeutic for tolerance induction, it will likely be most useful in combination with other strategies. 3. Memory T cells represent a major barrier to tolerance induction in the transplant setting and may make tolerance induction more difﬁcult in ongoing immunological diseases such as autoimmunity and allergy. Annu. Rev. Med. 2007.58:329-346. Downloaded from arjournals.annualreviews.org by University of California - San Francisco on 01/12/07. For personal use only. 4. Nonmyeloablative stem cell transplantation holds promise for the treatment of autoimmune diseases. 5. T cell receptor-directed antibodies that induce tolerance in animal models of autoimmunity appear to reduce pathogenic T cell responses and provoke regulatory T cells in humans. 6. B cell targeting remains a promising approach for promoting tolerance in autoimmune diseases and may be effective in certain transplant settings. 7. Signiﬁcant efforts are under way to determine if CpG-rich oligonucleotides linked to allergens can ameliorate allergic responses. DISCLOSURE STATEMENT JB has a ﬁnancial interest in OKT3γ1(Ala-Ala). JB and GSE are consultants for MacroGenics and Bayhill Therapeutics, which are developing immunotherapies for autoimmune disease and type 1 diabetes. AS, through the University of California, has a patent interest in the use of chimeric proteins to produce allergic tolerance. (The University of California holds the patent to this approach and has licensed this intellectual property to Biogen-IDEC Inc.) MHS is a consultant for Genzyme Corp.
ACKNOWLEDGMENTS This work was supported by the Immune Tolerance Network, a collaborative clinical research project headquartered at the University of California at San Francisco, and supported by the National Institute for Allergy and Infectious Diseases, the National Institute for Diabetes and Digestive and Kidney Diseases, and the Juvenile Diabetes Research Foundation. Figure 2 Potential targets for tolerance-inducing therapies. T cells and subsets of T cells (Th1, Th2, and Th17) are potential targets for intervention in tolerance-inducing strategies. Importantly, many different receptor:ligand costimulatory pathways can regulate T cell activation and may be modulated by specific agonists and antagonists. The activated dendritic cell (DC) and macrophage are the predominant professional antigen-presenting cells (APCs) and may be the focus of a tolerance intervention because of their central role in innate and adaptive immunity. The extent of T cell activation is counterbalanced by regulatory cells. Therapies that boost the function of regulatory cells may restore an imbalance of the immune system and downregulate a T cell–driven inflammatory response. Expansion of self-reactive B cells may stimulate autoimmunity, a process that may be potentially inhibited by blockade of BAFF or BAFF-R. In addition, TLR antagonists and cytokine inhibitors may downregulate certain types of inflammatory responses and promote a tolerant state. See text for further details. 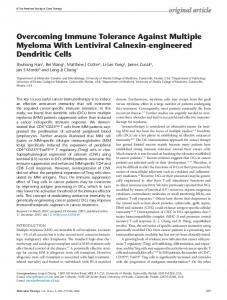 Report "New Reagents on the Horizon for Immune Tolerance"